In 1940 some pilots were staying in the “Cesar Hotel” located in Tijuana, one of the nights they arrived late and they wanted something to eat, the employees from hotel’s kitchen told the pilots that the kitchen was closed and there wasn’t anything to serve apart from a few lettuce leaves, so the pilots said to the Chef to cook them a simple salad and the Chef Livo Santini, prepared this salad, the pilots were so impressed that they called it “Ensalada Aviadores” (pilot’s salad). Nowadays the Cesar salad is famous around the world and it makes me feel very proud every time I say this story to people. Traditionally the dressing is made in a large wooden salad bowl and the dressing is mix with two wooden spoons, but I start making mine with a hand blender and finish mixing it by hand to avoid thickining it. So if you do the dressing on a wooden bowl, put the anchovy paste, mince garlic, mustard, lime juice, egg yolk, Worcestershire sauce, pepper and mix very well, then start adding the olive oil in small quantities and mix continuously, once you get a consistency with body, add some Parmesan and mix a bit more. 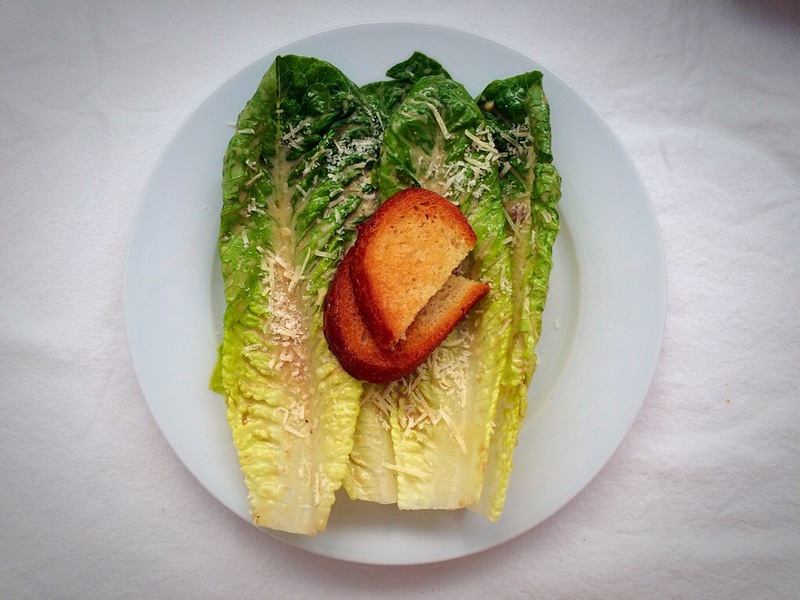 Add the romaine lettuce leaves and dress them very well with the dressing, sprinkle some Parmesan and serve with croutons. You can cut big pieces like I did and put them in the oven, tossed them with some oilive oil before and bake for around 15 min at 375 F or until harden or you can make little ones and do the same process.